Our world has many negative proclamations that focus on glorifying men rather than God. We are inundated with messages of the culture that we sometimes forget the amazing truths from the Bible. 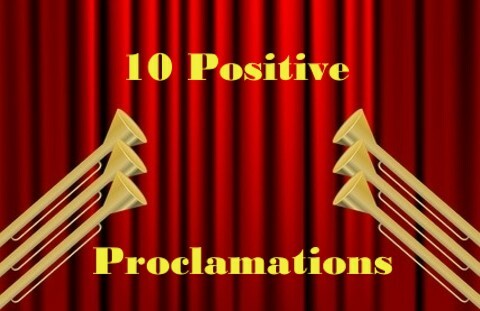 Choose one proclamation to memorize and meditate on this week. “Blessed be Abram by God Most High, Creator of heaven and earth. And praise be to God Most High, who delivered your enemies into your hand” (Genesis 14:19-20). After Abraham with his small army of 318 men defeated four kings, Melchizedek came out praising God with bread and wine. As believers we are faced with taunts and temptations from our united enemy, Satan. We depend on the Lord to deliver us from the devil so that we can walk in freedom in our faith. You, O Lord, will deliver me from my enemies. “Who among the gods is like you, Lord? Who is like you—majestic in holiness, awesome in glory, working wonders?” (Exodus 15:11). Moses testified of the wonders of God after the plagues and the parting of the Red Sea. God showed His greatness to the unbelieving nations. There is no one like our God who can see all things and work everything for our good. He’s all-powerful and no one can hinder His will. You, O Lord, alone are holy, awesome, and majestic. “And now, Lord God, keep forever the promise you have made concerning your servant and his house. Do as you promised, so that your name will be great forever” (2 Samuel 7:25-26). David knew he wouldn’t live to see God’s promises fulfilled in his lifetime—but he believed it anyway. God always keeps His promises. Just as David believed God, so we who follow after Jesus must put our trust in His promises even when we can’t see the fulfillment with our own eyes. You, O Lord, keep all of Your promises. “Lord, the God of Israel, there is no God like you in heaven above or on earth below—you who keep your covenant of love with your servants who continue wholeheartedly in your way” (1 Kings 8:23). Solomon recognized God’s covenantal love for His people who serve Him with their whole hearts. We are deeply loved and cared for by God even when we don’t feel it. His love is strong enough to outlast any threats or obstacles we face spiritually, emotionally, or physically. You, O Lord, love me completely. ‘Lord, let your ear be attentive to the prayer of this your servant and to the prayer of your servants who delight in revering your name. Give your servant success today by granting him favor in the presence of this man” (Nehemiah 1:10). Nehemiah was in a difficult place—he wanted favor from a king who didn’t serve God. Just as God heard and answered Nehemiah’s prayer, we pray to our heavenly Father who never misses our requests. He answers according to His will and in His timing—we just have to trust. You, O Lord, hear all of my prayers. “His dominion is an eternal dominion; his kingdom endures from generation to generation. All the peoples of the earth are regarded as nothing. He does as he pleases with the powers of heaven and the peoples of the earth. No one can hold back his hand or say to him: “What have you done?” (Daniel 4:34-35). Nebuchadnezzar was brought low in order that he could see that God was really in control. Even when it seems like our world is falling apart, God has a perfect plan and He’s never asleep or distracted from what goes in our lives. There’s nothing outside of His power and might. You, O Lord, are in control of everything. “Give ear, our God, and hear; open your eyes and see the desolation of the city that bears your Name. We do not make requests of you because we are righteous, but because of your great mercy. Lord, listen! Lord, forgive! Lord, hear and act! For your sake, my God, do not delay, because your city and your people bear your Name” (Daniel 9:18-19). Daniel interceded for the Jewish people because they wouldn’t survive without God’s mercy. We’ve all sinned and yet God gives us what we need—mercy—and not what we deserve—judgment. There’s great joy and humility in the knowledge of God’s mercy in our lives. You, O Lord, are merciful. “Peter replied, ‘Repent and be baptized, every one of you, in the name of Jesus Christ for the forgiveness of your sins. And you will receive the gift of the Holy Spirit’” (Acts 2:38). By the time of Pentecost, Peter had come a long way from his night of denying Jesus. He boldly proclaimed what people must do in order to be saved. Every person who comes to the Lord must believe in Him for the forgiveness of sins. When we turn away from our sins, we turn towards the blood of Jesus for cleansing. You, O Lord, forgive us of our sins. “But God has helped me to this very day; so I stand here and testify to small and great alike. I am saying nothing beyond what the prophets and Moses said would happen—that the Messiah would suffer and, as the first to rise from the dead, would bring the message of light to his own people and to the Gentiles” (Acts 26:22-23). Paul testified to the message of Jesus’s death and resurrection. Jesus’ agenda was about doing His Father’s will more than any of the miracles. By dying on the cross and rising again—multitudes of people would be saved from eternal death. You, O Lord, sent Your Son for me. “Look, I am coming soon! My reward is with me, and I will give to each person according to what they have done. I am the Alpha and the Omega, the First and the Last, the Beginning and the End” (Revelations 22:12-13). Jesus is coming back for His bride, the church. He will come as a fierce warrior on a white horse punishing evildoers with a word. Yet He will also usher in the millennium with peace and justice that the world has never seen. We are commanded to look for Him and be ready when He comes. You, O Lord, are coming soon. Today is your day to proclaim the Lord. He gives life to the dead, grace to the hurting, and strength to the weak. Proclaim each of these scriptures every day to speak hope to your heart. Previous post: What Does the Lordship of Christ Mean?